If you’ve been following me since before EDK came out, you may remember a scarf I was in the process of knitting back then. Here’s the story. 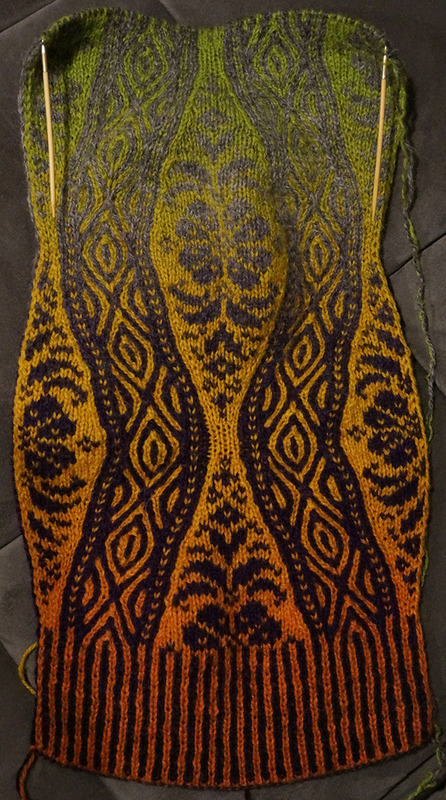 Once upon a time, I had figured out double-knit decreases but double-knit increases were still a mystery to me. When I finally filled that gap in my knowledge, I decided to work on a piece (a scarf) that allowed me to play with a whole series of different increases and decreases. I had recently discovered the wonder of Kieran Foley’s work and decided to adapt one of his charts to double-knitting. Never one to do things by halves, I realized that if I were to work the chart exactly as he’d created it, I’d be missing some important techniques. So I modified it subtly to make it a better practice piece. The chart I created has directional single increases and decreases, and centered double increases and decreases. That’s 6 techniques, each (of course) done on front and back of the work for a total of 12 different types of increase and decrease. This was assured to make me an expert in double-knit increases and decreases in short order. The piece came out beautifully, and got lots of attention in knitting groups and on Ravelry. When my book was in progress, I was about 2/3 done with the scarf. I wrote to Kieran and asked him if he’d allow me to publish the changed pattern in my book (with suitable attribution to him as the originator). He turned me down. To be fair, I was a little relieved — I had a lot to do and this just meant I didn’t have to finish the scarf. I bagged it up and it has been bagged ever since. Four years later, I got an email out of the blue from Kieran Foley. He’d reconsidered and decided to allow me to publish the pattern on Ravelry, with a 60/40 split for joint authorship. I was intrigued, and accepted his offer. I could finish the last 1/3 of the scarf and have it ready by the Fall easily! However, in those four years, I had learned much about double-knitting and designing in general, and I felt that the piece was no longer up to my usual standards. First of all, it was entirely done in twisted stitches — something I enjoy the look of but most other knitters will never do. 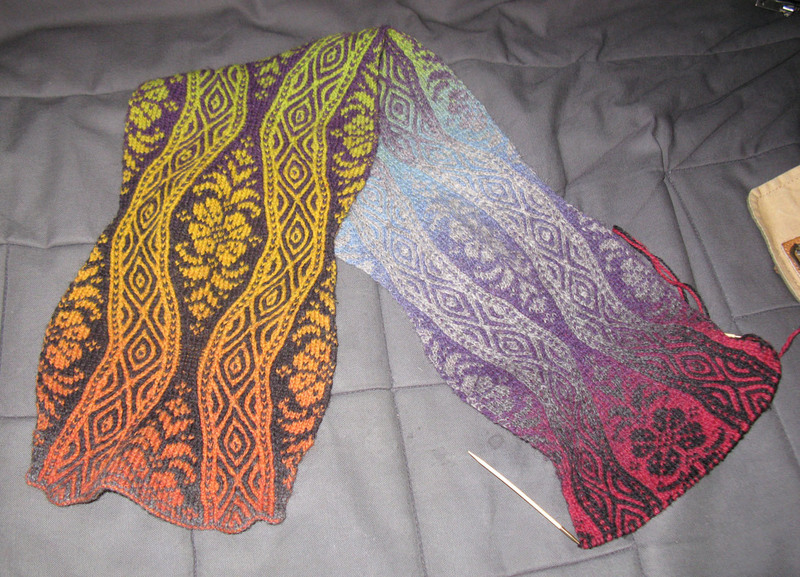 In addition, it’s a pain and a half to do double-increases into twisted stitches, even with very pointy needles. Second, unlike any of my more recent scarves, it was done without selvedges, which meant the edges were harder to keep smooth and clean. Finally, it was done without any embellishment to the bottom edge, which meant that the increasing and decreasing created a couple of bulges along the bottom. After much deliberation, I broke the yarn and started again with a fresh cast-on. The new revision of Victorian Raffia has a section of mock-ribbing similar to the ends of Corvus. However, because of the main pattern, the mock-ribbing flows seamlessly into parts of the chart. The new chart is an 80-row repeat rather than the 76 of the original, so that the “river” sections which are a 20-row repeat will be able to match up nicely with the larger chart. The river sections themselves use some no-pair elements to smooth out the movement of the knots-&-crosses pattern. There’s a new type of increase I’ve never used anywhere else, which means there’s a total of 14 increase/decrease techniques now. And of course, it’s now done with a selvedge and “normal” stitches so that it will more closely resemble other people’s work. Now it’s time for me to apologize, once again, for the next part: this pattern will be done when it’s done. I can’t release it until the scarf is finished and photographed, and I’ve got several other things to do at the same time, which will necessarily slow this one down. 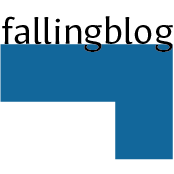 The good news is that I’m very much enjoying working on it, and will endeavor to get it done as soon as I can. But the nature of the piece means that it will take a while to finish, and I hope you will be patient in the meantime. Wow; that’s gorgeous! The mock ribbing looks lovely; beautiful CO. Glad you are enjoying the 14 techniques; a tad daunting to me, but you are actually enjoying it! WTG!!! I enjoy reading about your design process. Sounds like that four-year hiatus turned out serendipitously!